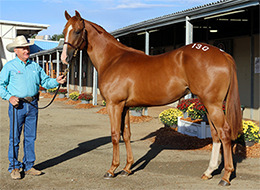 Roger Daly with Friday's opening Ruidoso Select Yearling Sale $300,000 topper A Sweet Jess at Ruidoso Downs. RUIDOSO DOWNS, NM—AUGUST 31, 2018—A $300,000 Arizona-bred colt by leading sire Apollitical Jess topped the opening session Friday night of the 2018 Ruidoso Select Yearling Sale in Ruidoso, New Mexico. A total of 95 yearlings grossed $3,619,000 and averaged $38,095 in Friday's opening session. The average climbed 31.5% over the 2017 figure of $25,086, however last year's opening session was shortened due to power outage in the city of Ruidoso and only 48 head were sold. This year's opening session median of $23,000 is compared to $17,500 in 2017. Of the 138 cataloged on Friday, there were 15 horses OUT and 27 RNAs. Reliance Ranches, LLC paid $240,000 for Hip 80, Mr Ricks, a son of leading sire Mr Jess Perry from the stakes winning and multiple stakes producing First Down Dash mare Aquafina. 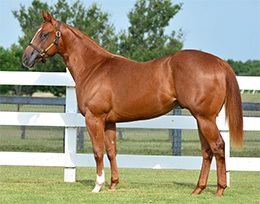 Lazy E Ranch, LLC, Agent for McColee Land & Livestock consigned the half-brother to stakes winner Corona Springs. This is the family of world champion Wave Carver and champion Ocean Runaway. The third sale topper on Friday was Hip 26, Jess Different, was purchased by Dillon Lane for $220,000. 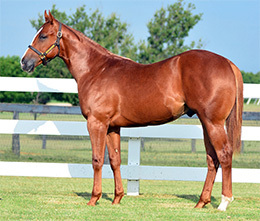 Also consigned by Lazy E Ranch, LLC, Agent for McColee Land & Livestock, the colt by leading sire Mr Jess Perry out of another stakes winning First Down Dash mare Little Surfer, a full sister to the above-mentioned Aquafina. Little Surfer is the dam of G1-placed Call Me Cole and stakes-placed Rip Tide. Don Cavenaugh was the opening session leading buyer with two purchases for $390,000. Reliance Ranches, LLC had two gross $365,000 and Dillon Lane had the one for $220,000. Lazy E Ranch, LLC, Agent for McColee Land & Livestock was the first session leading consignor with six head totaling $838,000. Roger Daly, Agent for Allred Brothers Ranch LLC sold two head for $317,000 and Bobby D. Cox had six yearling gross $22,900. Lazy E Ranch, Agent also sold another seven yearling for $207,000. Mr Jess Perry was the opening session sale sire leader (by average, two or more sold) with seven head averaging $107,714. Apollitical Jess had six average $94,333 and Pyc Paint Your Wagon sold two for a $57,000 average. For preliminary results for Friday's opening session, including hip-by-hip results CLICK HERE. Session 2, featuring hips 139 thru 276, will get under after the close of live racing at Ruidoso Downs on Saturday and the final session of hips 277 thru 416 will be offered on Sunday after the close of live racing at Ruidoso Downs. Horsemen and women can download a copy of the 2018 Sale Catalog by CLICKING HERE. The complete yearling catalog, including horse, consignor, sire and dam indexes, is also available through the RGP Catalog App for iPad, iPhone, Android phones and Android tablets. To download the RGP Catalog App visit the Apple App Store or Google Play. Preliminary sale results for Saturday and Sunday's sessions can be found on StallioneSearch.com's SALE SECTION shortly after the close of each day's sale.